WASHINGTON—A crazed grin spreading across his face as his eyes darted wildly from one paramedic to another, sources said Tuesday that a babbling Senate Majority Leader Mitch McConnell demanded that the EMTs loading him onto a stretcher outside the Capitol vote ‘Yes’ on the Graham-Cassidy healthcare bill. 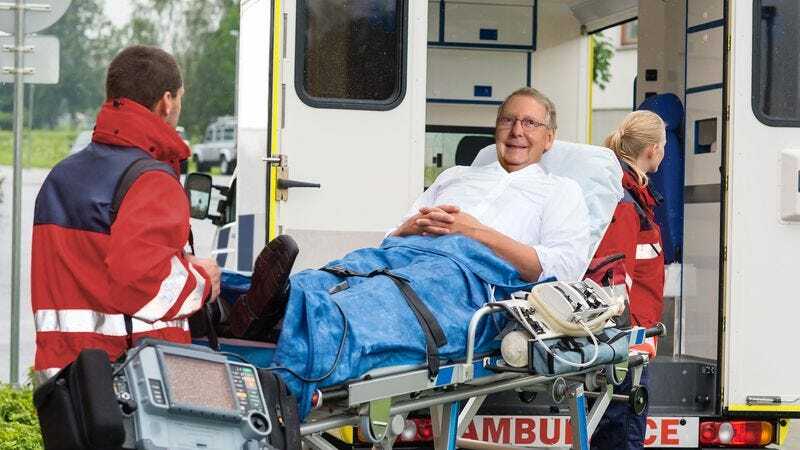 “Obamacare is collapsing under its own weight, and the American people have suffered enough under its tyranny—we must take action!” shouted McConnell, launching into a speech he had reportedly planned to make on the Senate floor but was now delivering to the two medical technicians strapping his arms to a gurney and preparing to administer an IV. “The time is now to repeal the Affordable Care Act and replace it with a plan that will cost less and restore freedom to the states! We cannot delay any longer! We cannot delay!” At press time, McConnell’s motion for a roll call vote was muffled by the oxygen mask being placed over his mouth.